remix,” a piece that was originally performed by Sekou as a solo work, and is now being presented by three of us-Carl Hancock Tux, Mike Ladd, and myself. Just finished rehearsal a few house ago-staying in a hotel that looks over the World Trade Center. Death and life, in the window, all around, and within Sekou’s piece. It’s a beautiful piece, an unbelievable, poetic journey in which Brother Sekou lays it all out, an amazing work that continues to deepen as we continue to explore. Hope to see you all there at the Tribeca Performing Arts Center here in New York City. 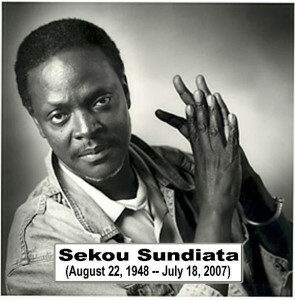 For more info on blessing the boats: the remix, click here, for more info on the life and work of Sekou Sundiata, click here. This entry was posted in BLESSING THE BOATS: THE REMIX, NEWS, PHOTOS and tagged Carl Hancock Rux, Culture, Harlem, LMCC, Lower Manhattan Cultural Council, MAPP, Mike Ladd, New York City, Poetry, Rhodessa Jones, River to River Festival, Sekou Sundiata, Theater, theatre. Bookmark the permalink. Trackbacks are closed, but you can post a comment.